Toronto Dogs Directory: My Day At The Ontario Legislature, Or As I Now Prefer To Call It, "Kindergarten"
My Day At The Ontario Legislature, Or As I Now Prefer To Call It, "Kindergarten"
Yesterday, I had the privilege of being invited to Queen's Park by Newmarket-Aurora MPP Frank Klees to witness the provincial debate on the issue of oversight over the Ontario Society For The Prevention Of Cruelty To Animals (OSPCA). 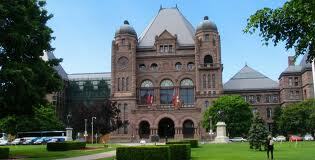 The debate lasted roughly one hour, and MPPs from each of the major parties rose to express their opinion. In the end, Mr. Klees' resolution was defeated by a vote of 24 to 17. Personally, while I am disappointed with the result of the vote, I came away from the proceedings with a newly found sense of tremendous disillusion toward our legislature. Such disillusion came not only from the result of the vote itself, but also from the behaviour exhibited from several of our MPPs, the individuals that WE HAVE CHOSEN to act on our behalf. I am certain that the actions I witnessed yesterday are not reflected when we watch the proceedings of the Ontario Legislature from the comfort of our own living rooms. You need not worry however, for the comfort of our elected representatives. So many of them acted as though they were in their own homes, apparently clueless to the fact that there was a real live debate, an extremely important one at that, transpiring right before their very eyes! Rather than listen to their opponents arguments, at least a dozen MPPs sat idly, texting away on their mobile devices (they did so most of the day). Giving these members the benefit of the doubt, perhaps they were receiving important counter arguments from their personal political strategists with which to attack their opponents. What is odd however, is the fact that the majority of those members who were texting never rose to express such arguments. FYI, those in attendance in the gallery were not allowed to bring our electronic devices inside. The prize for the most indifferent MPP however, goes to Liberal MPP Wayne Arthurs, who rather than absorb any of the debate, spent the majority of the day reading the newspaper. Colour me befuddled. As is expected in a lively discussion, debaters from respective sides often attempted to distract the opposition by speaking loudly and offering counter arguments. What I did not expect was that at times, it became almost impossible to hear the individual who had the floor at a particular moment due to the personal discussions (often at least ten) going on around them. It was akin to your mother standing up at Thanksgiving supper to say grace, and while she is doing so, everyone else in the family is discussing who got voted off of Dancing With The Stars! Can the people WE HAVE CHOSEN to represent us give one another (and more importantly the voting public) enough respect to at least PRETEND as though they care about the issues that we as Ontarians hope they will address? I understand that everyone, no matter the occupation, has a bad day or two and doesn't perform at the greatest of their abilities, but this clearly was not the case. Perhaps if you have found yourself at the point where you would rather read a newspaper than attend to the matters at hand, that is your cue to seek alternate employment. If you as an MPP have become that disheartened with such issues, imagine how we as Ontario voters must feel.